is powered by ARM big.LITTLE technology, comes with a Heterogeneous Multi-Processing (HMP) solution. ODROID-XU3 is a new generation of computing device with more powerful, more energy-efficient hardware and smaller form factor. Offering open source support, the board can run various flavours of Linux, including the latest Ubuntu 14.04 and the Android 4.4. 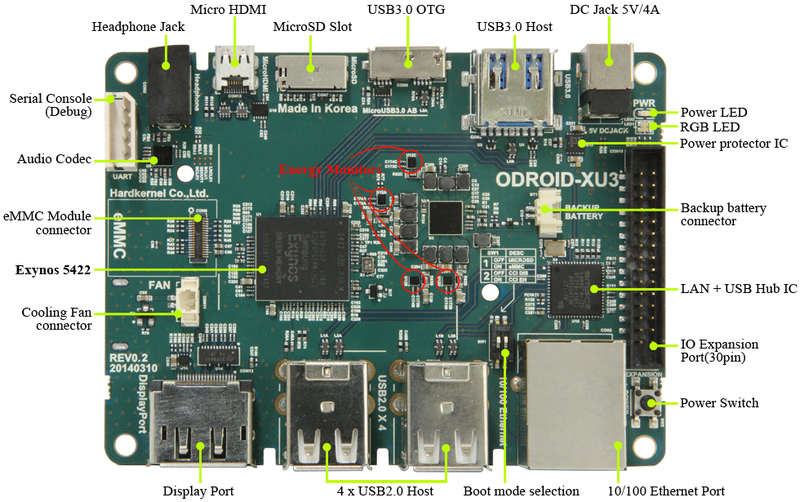 By adopting e-MMC 5.0 and USB 3.0 interface, the ODROID-XU3 boasts fast data transfer speed, a feature that is increasingly required to support advanced processing power on ARM devices that allows users can fully experience an upgrade in computing such as faster booting, web browsing and 3D game experience. If this isn't spam, my apologies, but I really don't see the point. This has a single 10/100 NIC which is likely hooked up via USB. Based on the screenshot in your link, it's drawing about 5W (not counting PSU efficiency losses), a large portion from the GPU which likely can't be turned off, and it's only using one CPU core at that point. Once it starts doing something you'll add another Watt or two. By the time you added some Gigabit USB NICs to this, which aren't really recommended, you'd be a couple watts higher than that (and you'd have a bunch of dongles sticking out of the board). This board would make a great set top box with Plex or similar, but I just don't see it as a router. Seems like you'd be better off with something like the APU board or even an Alix. can you please recommend one. ps. that kind of processor seems powerfull for addon packages on pfsense ex. activirus, proxy and so on…. PfSense will not run on this board so don't buy one for that purpose! To make any sort of recommendation we need to know your expected throughput.